Consumer inclination towards meat & meat products consumption owing to increase in protein intake for better diets may drive liquid feed market size. Asia Pacific poultry meat consumption was over 35 million tons and accounted for over 65% of the total market share in 2016. These feeds are most economical efficient and fast effective in in maintaining and promoting animal health as they are anti-allergic, nontoxic and easily digestible. Increasing demand for high quality meat products supported by rise in consumer spending on food services may have positive influence on product market size. Government supported organizations such as CAFO engaged in industrial livestock production supported by shifting trends towards development of landless meat production facilities which is likely to promote industrial meat production. U.S. cattle production industry was valued at over USD 80 billion in 2016. Feed lot raised animals are given compound and liquid feed to promote growth and increase meat quality. These products are fortified with proteins minerals and vitamins are given to these animals to maintain high quality meat production and livestock industry. Shift in manufacturers inclination towards animal health may surge livestock industry thereby driving product demand. Liquid feed manufacturing consists of various industrial liquid by products such as bakery waste, acid whey, buttermilk, sweet whey from milk processing, brewer’s yeast, sugar syrup and liquid by products from ethanol manufacturing which are easily accessible and available in large quantity. Companies are adopting liquid systems to utilize their liquid by products. Increasing application scope in aquaculture industry due to enhanced growth performance may favor industry growth. High end technology used in manufacturing supported by easy availability of raw materials in sufficient quantities which helps in reducing overall product cost than compound feed. Production process is not a labor-intensive process which is another major factor contributing towards cost effectiveness. Key raw materials used in liquid manufacturing are soybean, fish meal, fish oil, corn and maize. Rising costs of feed raw materials and availability are major challenging factor for industry growth owing to demand supply gap which may affect liquid feed market price trend. Molasses containing liquid feed market size is poised to surpass USD 25 billion by 2024. Molasses incorporated by salt, protein meals, urea, phosphorous and rumen modifiers are cheapest energy supplement for cattle growth performance. It also helps in increasing feed palatability by enhancing feed taste. Easy availability in sufficient quantity may boost product demand. Corn steepwater ingredients demand in the product formulation may register gains at over 4% at the end of 2024. It is widely used feed ingredient for ruminant and swine feed ingredient and as a binder in various other feed applications. it contains high protein level which improving milk yield in cattle along with increasing live weight in beef cattle and pigs. 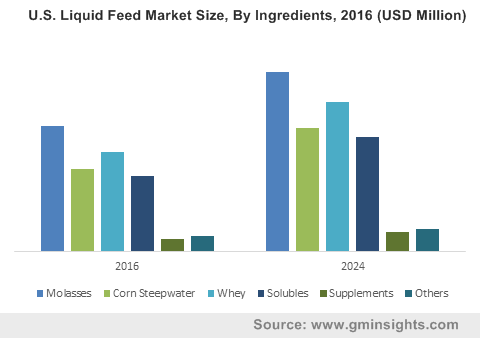 Liquid feed market size from poultry applications is anticipated to exceed USD 15 billion over the forecasted timeframe. These products improves bodyweight, optimizes egg production along with improving hatchability and livability in poultry animals. Increasing government support along with financial assistance in poultry farming may boost product demand thereby promoting industry growth. Liquid feed market share from ruminants may witness strong gains at over 4% by 2024. These feeds offer cost effective feed accompanied with complete nutrition requirement to improve growth performance. Growing concerns over meat safety and quality along with shifting consumer preference towards beef meat mainly in European countries may propel industry growth. Europe market size may witness gains at over 3.5% at the end of 2024. Changes in dietary preferences has led to rise in dairy and meat products consumption accompanied with usage of intensive farming systems may favor regional industry growth. Asia Pacific led by India, Japan and China liquid feed market size, expects gains at above 5%. Positive indicator towards livestock industry along with rapid economic development should propel regional growth. 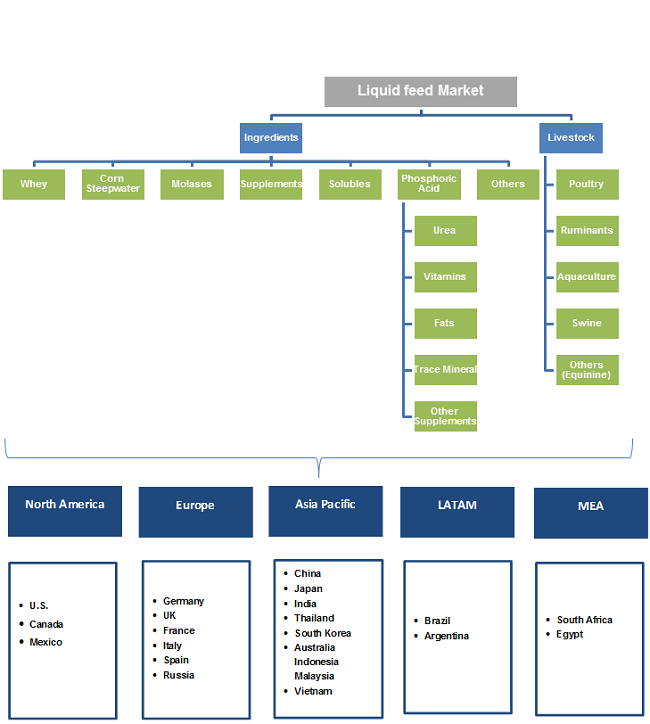 Global liquid feed market share is fairly fragmented with major market players operating in this industry includes Archer Daniels Midland, Cargill, Grain Corp, BASF SE. Other players operating in this market include Ridley Corporation, Performance Feeds, Westway Feed products, Quality feeds, Dallas Keith and Land O’ Lakes. Companies are focusing on strategic alliances and product innovations along with capacity expansions to gain competitive advantage which is likely to have positive impact on industry growth. Liquid feed is complete nutrition diet supplement for livestock including ruminants, swine, poultry and aquaculture. It contains high nutritive value with proteins, minerals and vitamins which helps in increasing growth performance, feed palatability, weight and boost metabolism. It consists of molasses, corn steepwater, supplements, whey and soluble as essential ingredients. Increasing R&D expenditure along with cost management supported by rising awareness regarding animal nutrition drive industry growth.